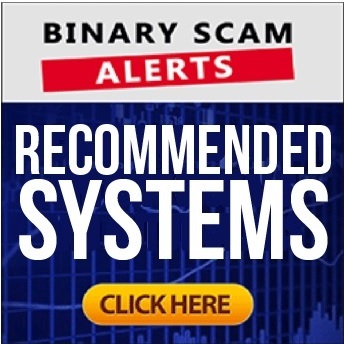 Binary Scam Alerts is posting a severe SCAM review and BLACKLIST notification in regards to the Bank Tracker Bot software, app, and auto-trader as well as Michael George the fake cheater and philanderer. Some of our loyal members recently filed a complaint describing how they were practically mauled by SPAM email marketers illegally soliciting them to register with rogue and unregulated offshore brokers. The emails contained messages about massive profits on auto-pilot with no risk to the initial investment amount. Obviously, we recognized this type of baiting and how it used to mislead and deceive innocent day-traders so we immediately launched a full investigation and reviewed this system. Our results were clear, conclusive, and decisive; we are dealing with a dangerous and malicious binary options internet investment SCAM. 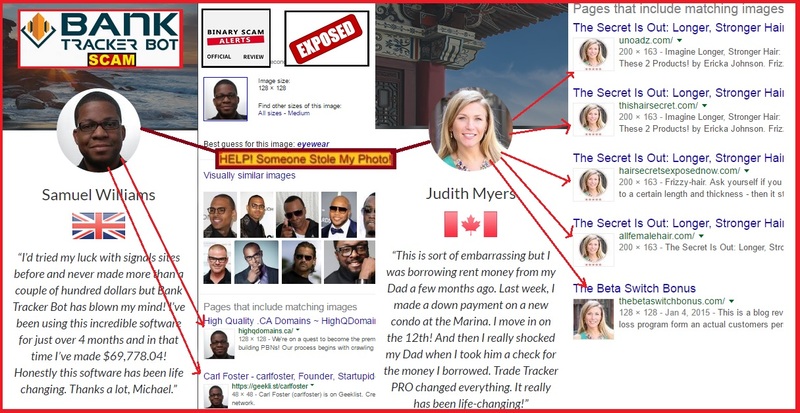 The image below illustrates how image bank photos are used in every single one of their fake testimonial section. I could not find one legit person who can actually provide a valid account of their experience with the app. These people have also implemented an additional layer of sophistication and are using a fake social widget to give it a more updated and dynamic look-and-feel. This is a ruse and as you can see below “Anthony Harrison” is also used in the Azure Method scam where he is prominently displayed as a “verified winner”. Finally, here’s the actual software where you can see it’s the same rehashed code as used by the Perpetual Formula scam as well as other very “prominent” schemes. Michael George presents himself as a part time trader living in Chicago and working 2-3 hours a day. This ripoff artists apparently owns a new Maserati Granturismo and married to a 25 year old wife as he so proudly states. As the story goes, he previously had a dead end job at an IT firm debugging programs for a client until one day he got a call from “Steve” (whoever that is) who found a method to profit consistently by trading bank stocks (namely HSBC, Chase, Barkleys, and Deutche Bank). This method involved trading binary options directly on bank stocks which he claims to have low volatility. Since then they have “perfected” this method and have made it available to customers who want to “take action” and allow it to trade on autopilot. In reality what we are seeing here is another system which locks you in with a bonus. We have written extensively about this tactic and how it is used to deny payments. When you accept a bonus you will need to sign a document in most cases where you formally acknowledge the fact that you have to trade a certain amount of times in order to qualify to receive the bonus and/or winnings that originate from it. The higher the bonus is, the more you have to trade since this is a way for brokers to mitigate their risks. This is the stage where you realize you have been bamboozled and get that feeling in your belly where you want to do something really bad, but it won’t help. Neither will trying out new strategies such as technical analysis with candle sticks or Bolinger Bands on 60 second options. Just count your blessings and thank the lord you have not lost more money. Absolutely not! You will need to pay at least $250 and it will be paid through their broker which may or may not be regulated or honest. If you wish to maintain good health and a positive state of mind please make sure to stay away from Disrupt Trading, GPS Trader, Push Money App, Binary Matrix Pro, the Drexel Code, Amissio Formula, Quick Cash System, Millionaire Blue Print, Free Money System, and Lie Detector Millionaire. There’s a ton of systems out there and obviously the vast majority of them are fake apps that will promise you vast riches at the click of a mouse. Needles to say most of them are useless, and do not live up to their expectations. Our recommended section offers the best and most credible systems available today. 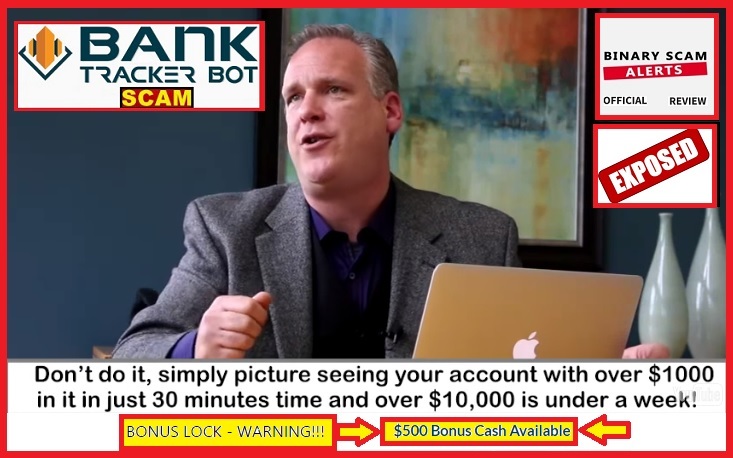 The Bank Tracker Bot software, app, and auto-trader as well as Michael George is a confirmed binary options investment SCAM. There is not one thing which is legit, genuine, honest, or sincere about it besides the intent of the people behind it to fleece your wallet and steal your money very quickly and efficiently. This system will intentionally take losing trades and split the profits with shady offshore and unregulated brokers. We urge all our members and viewers to exercise extreme caution if or when being approached with this offer and seek alternative means of investing. Join our Facebook group and subscribe to our YouTube Channel to get informed.